A Thanksgiving recipe for all the picky eaters at the table. 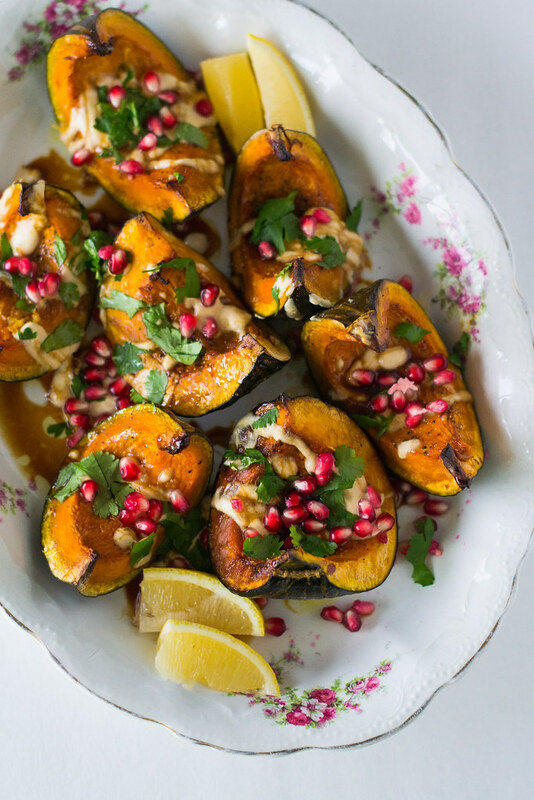 This roasted kabocha squash is buttery and tangy, vegan, gluten free and layered with exotic Mediterranean flavor. 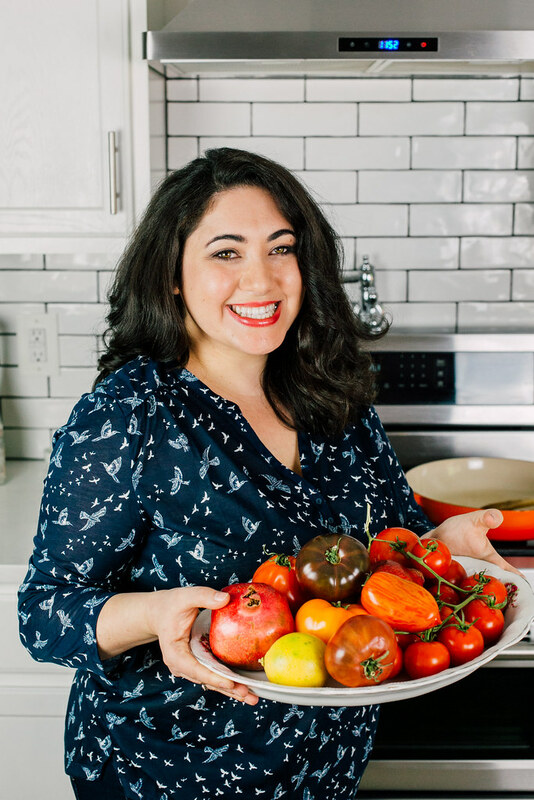 I love throwing a Mediterranean or Jewish spin on traditional dishes. A new revelation for me to be honest. A few years ago I was a dead-hard “keep it true to it’s form”. However with changing pallets and blending cultures, there is nothing exciting than creating something unique and delicious. I just can’t get over those gorgeous colors. 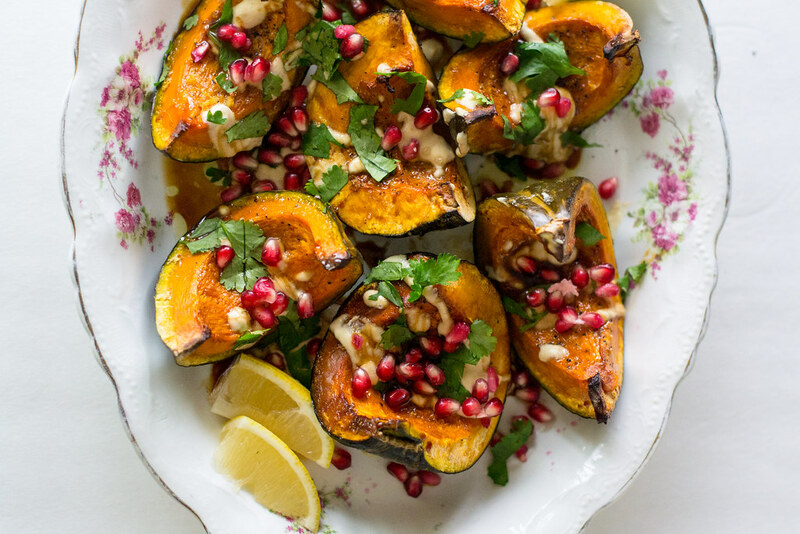 The contrast of the deep orange kabocha squash flesh with the jewel-like pomegranate seeds and the pop of brightness from the lemon. Thanks to a stop at a local pumpkin patch called Gordon Skagit Farms right neat Bellingham, my girlfriends and I picked loads of pumpkin and squash. Kabocha squash was on my list of must haves and I have to tell you, there is a HUGE different in a freshly picked local squash versus a store bought one. The freshly picked squash was more tender, easier to cut into, richer in color and dare I even say a bit more buttery and sweet. This kabocha squash recipe couldn’t be easier. Once you have someone strong to cut the kabocha into wedges, brush everything with maple syrup. This will help the edges caramelize, then generously sprinkle olive oil all over and season with salt and pepper. After roasting, top with all the delicious flavorings; bright lemon zest, tangy pomegranate molasses and creamy tahini. For added crunch and color, pomegranate seeds, fresh cilantro and an extra helping of lemon wedges. I wish you all a wonderful Thanksgiving and I am so thankful to share my recipes with you and to read your comments and share our stories. Place kabocha squash on a lined baking sheet and brush the flesh with maple syrup and season with salt and pepper, cut side up and roast at 400 degrees F, for about 1 hour or until flesh can be easily cut into. 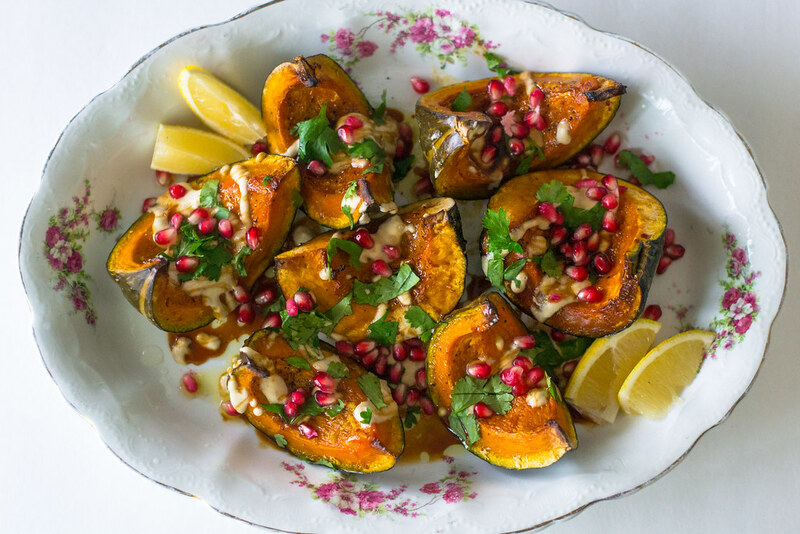 While squash is cooking, mix together the tahini and a bit of warm water so it turns into a pourable consistency. It may firm up a bit as it sits but just mix it up again and it will be fine. 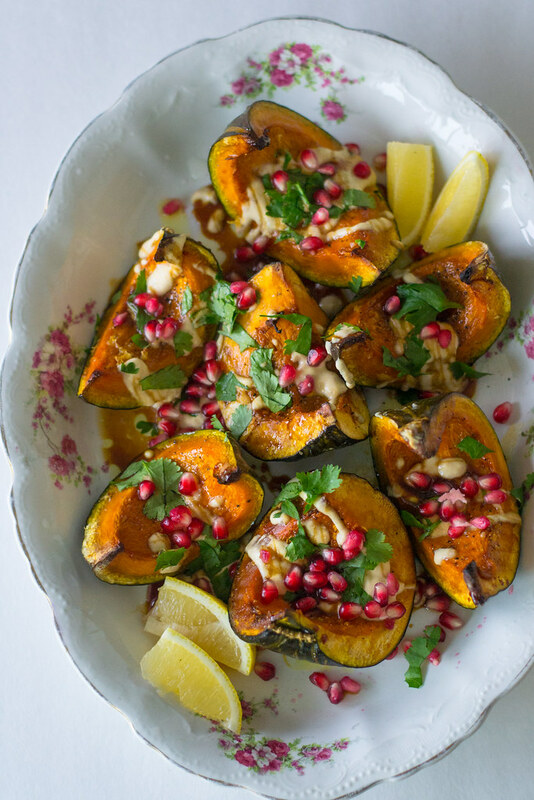 Once squash is done roasted, remove from oven and drizzle with pomegranate molasses, tahini and lemon zest. Then top with pomegranate seeds and fresh cilantro and an extra drizzle of olive oil. Serve with lemon wedges.